Note: The following is a guest post by Tableau Social Ambassador Emily Kund. My data mentor is my data BFF, Matt Francis. He pushes me to push myself. Matt sometimes just commits me to things, which can be frightening. He once challenged me to reimagine Kelly Martin’s awesome viz on the Alberta oil spills. There really was no way I could improve on Kelly's viz (I mean, it's Kelly Martin, whom I hold in high regard! ), but I had to give it a go. Did I love the result? No. But did I learn something? Yes. I learned that Kelly is so gracious. Instead of saying my viz was complete rubbish, she was kind in her comment. I also learned you need to be a little uncomfortable to grow. Mentoring is such a great way to learn for both the mentor and the mentee. Through this relationship, we provide counsel and help each other grow. This can work almost any way you’d like. It can be formal (assigned) or informal (unassigned). It can be short or long-term. For long-term mentoring, it’s important to build a relationship around a genuine connection. Like football? Have kids? Like scrapbooking? Cool! These are things that can start a conversation. Because when people build relationships, they become more vested in helping the other person succeed. They’ll make time to answer your questions or help you noodle through a problem. So what might you learn from a mentoring relationship? 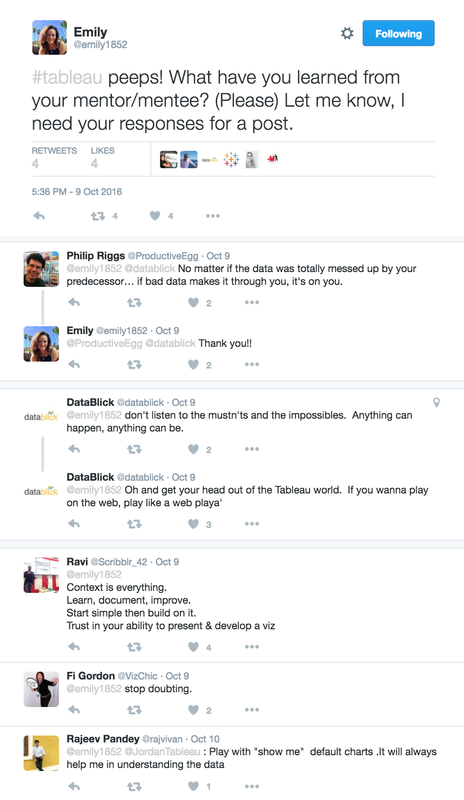 I asked the Tableau community what advice they’ve shared or received. Interestingly, people didn’t list technical know-hows; what they shared was more motivational than anything. I also heard from people who said their unofficial mentor had given them the confidence to engage, contribute, and reach out. This might be some of my favorite tips. You can have mentors for different aspects of your life or work. In my case, in addition to Matt, I've found others to learn from. This group includes people like Emily Chen of The Information Lab and Anya A’Hearn of DataBlick. Their perspectives and their technical skills (mapping, Alteryx, and design) make me want to fill the rest of this sentence with heart-eye emojis. For example, I could ask Allan Walker to mentor me on the basics of coding. I could ask Anya about data-viz design principles. And I can reach out to Brittany Fong to explore tile maps. The point is that there is no one mentor to rule them all (did you get that subtle LOTR reference?). As a mentee, you have to be willing to give back to your mentors. But how, you ask? Maybe it’s by being a sounding board or by providing blogging tips or presentation skills. Your strengths may not be your mentor’s strengths, which means you have things to contribute as well. This is important because mentoring isn’t a one-way street. Even if you can’t give something back immediately, you can extend an open invitation to help anytime. But do mean it and do deliver if the person indeed does ever reach out. At the end of the day, I see mentoring as a form of leadership. It means going beyond yourself to make the world—even if only a small corner of it—a better place. Because you asked for mentoring or because you became a mentor, you've gone beyond yourself. And finding a mentor can help you hone your professional skills, up your data-viz game, and expand your network. And there’s room for all kinds of mentoring in Tableau and data viz. You just have to find someone who you connect with and start talking. To help you get started, I created this viz to help facilitate connections at #data16. Sign up to be a mentor or a mentee, then meet your match at TC16! For more tips, tricks, and ideas by Emily, check out her Tableau Public profile page and her blog. You can also connect with her on Twitter @emily1852. This is one of my favorite posts on the blog -- great advice here!!! Life changing, perhaps?